Speculation is a natural part of being a collector. Which licenses could possibly become official Minimates some day? What if Diamond Select Toys could get any license? 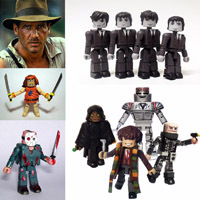 Today I am going to tell you about the 5 properties I would like to see as Minimates if licensing was not an issue. I think my first 4 choices are pretty common, and the last one is definitely out-there. Click Read More below to see the full list!